Velvet Paw Creations: CAS Christmas Tree Bauble Card - one day left in the CAS Blockheads Challenge! CAS Christmas Tree Bauble Card - one day left in the CAS Blockheads Challenge! Blockheads Paper Arts' Clean and Simple challenge ends tomorrow, Nov 21. Here's another example of the CAS technique to inspire you! You can read all the details about how to enter the challenge and check out the challenge tutorial HERE! There's two prizes up for grabs! A $25 gift certificate if you enter the Blog Hop or 4 x 5.25 inch stamp set of your choice if you enter on the Blockheads' Facebook page! 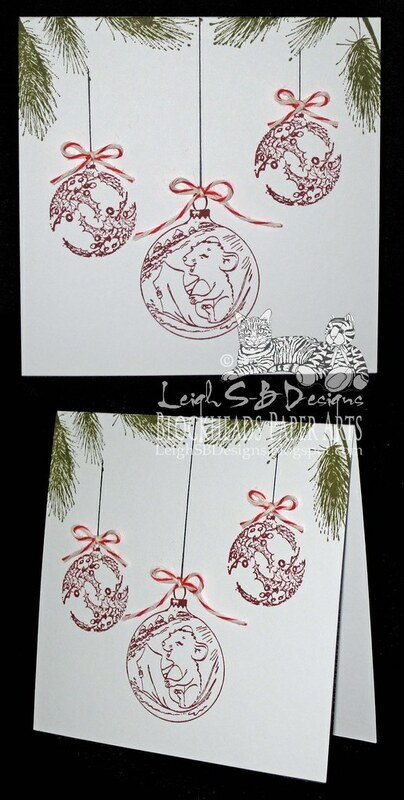 For this super easy CAS Christmas Card I stamped the greenery with Forest Moss Distress ink and the baubles with Aged Mahogany Distress ink. I drew in the hanging string lines with a black Copic Multliner pen and finished off each bauble with baker's twine bows. I hope I've inspired you to create some Clean and Simple cards this season and I look forward to seeing your entries in the challenge ;0) You can link up to the Blog Hop in the inlinkz collection below! Thanks for stopping by and Happy Thanksgiving to all my USA readers! Great way to use the stamps. The ornaments are soooo cute!! Fab CAS christmas card Leigh !! Thanks so much for sharing it with us this week at The Crafty Pad !! I love the simplicity of this card. Such a beauty. Thanks for sharing with us at Clearly iStamp challenge.